Commercial building surface mounted and pedestal office directory signs. The easier you are to find for your customers and clients the more likely they’ll be to return and use your services again. Therefore, many office buildings, schools, and libraries can benefit from having a directory sign. You have various designs to choose from so you can easily place a changeable sign on a wall or have it stand on a pedestal wherever you need it at the time. Our lobby directory is made with aluminum and comes with a powder coat finish and shatter resistant acrylic framed see-through door. This door features a locking mechanism to keep people that don’t have the key from accessing the message inside. A surface mounted shop directory is great for lobby areas where you will always need a permanent sign directing customers to their right location. The directory and pedestal option is made with aluminum and has a black background for easy reading. 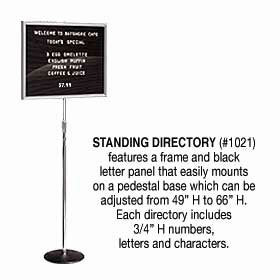 The pedestal directory can be used virtually anywhere and is easily stored when not in use. You will find this option is great for those that need to frequently move a sign from place to place. The stand conveniently adjusts between 49 and 66 inches. 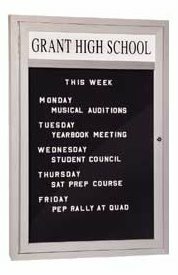 The marquee directory is another surface mounted letter sign that is made out of aluminum and comes with a shatter resistant see-through acrylic door. Like other options, this changeable sign has a black background and comes with a locking mechanism to keep the letters from being rearranged. This display sign has a white acrylic header panel that you’re able to customize to say your personal message. For buildings that host a lot of parties or events, using wayfinding signs can be a great way at letting attendees find their location quickly and efficiently. They can save money by not needing a person to direct people to where they need to go. 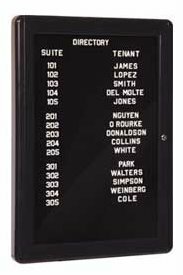 If you have multiple rooms that are being used for conferences or meetings of some sort, having a portable directory sign is an excellent way to display what meeting or class is taking place inside each room. Surface mounted marquee signs are perfect for areas that may frequently change where a certain service is being offered. In order to save money on permanent labels, a changeable sign allows you to change the name of the company or person within each office as they come and go. The locking mechanism allows those that have the proper key to gain access to the letters and change them when appropriate. Surface mounted signs can be used both indoors and out. Foyers or places next to stairways or elevators are convenient locations to place a directory. You’re given different letters, numbers, and characters to place inside the sign with your order. Often white, they are easily seen with the common black background. The letters are large enough for people to easily read. The professional appearance works well with any commercial setting. No matter where you need a sign, whether it’s for a school, library, or company function it will blend in with its surroundings, yet stand out so people can easily find it. This article was published on Thursday 11 September, 2008.